A rich dessert every chocolate lover would love. According to culinary legend, the chocolate lava cake was the result of a major kitchen disaster. The dessert was meant to be individual chocolate cakes that were taken out of the oven to soon. What came out are chocolate cakes with gooey centers. Using a double-boiler, melt the butter and chocolate together and stir to combine. In another bowl, whisk together the eggs and sugar until the mixture is light yellow in color, and the sugar is dissolved. About 3 minutes. Pour the warm chocolate mixture into the egg mixture and whisk until well incorporated. Fold in sifted flour, cocoa, and salt into the chocolate and egg mixture using a spatula. Spoon into 4 buttered 5-oz ramekins, and tap on the table to settle any air bubbles. Refrigerate for 30 minutes. Remove from the oven and serve warm. 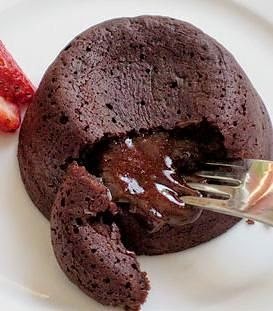 The chocolate lava cakes can be turned out on a plate or served in the ramekins with a sprinkling of powdered sugar.